The travail for immigrants wasn’t limited to the journey and Ellis Island processing. They could still be exploited and/or treated harshly before reaching their final destination as this 1910 report to the Presidential Commission on Immigration reveals. 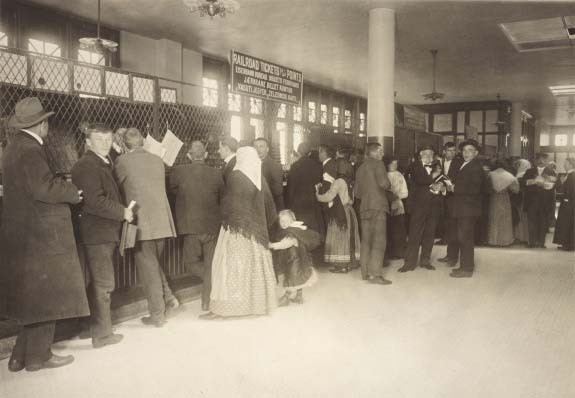 “At Ellis Island, the inspection by the doctors and the officers of the Immigration Service was quickly completed. The work here has been reduced to a smooth system and the officers are all kind, considerate, and humane until one has passed the boundary of their immediate jurisdiction. “After getting my railroad ticket, I was approached by an agent of the telegraph company. The ordinary immigrant would not have distinguished him from the immigration officials. ‘Show your address,’ he commanded. ‘What’s your name?’ and before I knew what it was all about, ‘Thirty cents for the telegram.’ And so he caught them, except those who had been there before and refused to be caught again. Later, I learned the usefulness of these telegrams. It said, ‘Meet me at Union Station,’ but mentioned no trains. My friends spent a night at the station and then didn’t meet me. The other telegrams are about as effective. “Further on in the room, where the immigrants are sorted according to the railroad by which they are to continue their journey, they are considered prey. A rough guard pushed me to the pen into which I belonged. A commissary clerk met me, led me to a spot where my baggage could be deposited, then to a counter, saying ‘Show your money.’ I was about to obey, as a steerage passenger obeys these commands given at so many points of his journey, when I concluded that this was the attempt to compel one to buy a box of provisions for his further journey. Many of the passengers had told me of it and warned me. “I refused to show my money, saying I was going only to Baltimore and did not need provisions for so short a journey. The man continued shouting, thinking thus to force me into buying, until he spied someone else entering. Then he dropped me and ran for the new victim. “Immigrants who had been here before, and refused to be forced to buy, received volleys of oaths and curses. The immigrants are practically forced to buy these boxes, regardless of the length of their journey or their desires. One man bought a [five-cent] cigar and handed over a dollar. Three quarters were laid down in change, and when he demanded the rest, the clerk insisted on his taking something more instead of the 20 cents, and hadn’t the immigrant been experienced in the ways of the world he would have had to yield. 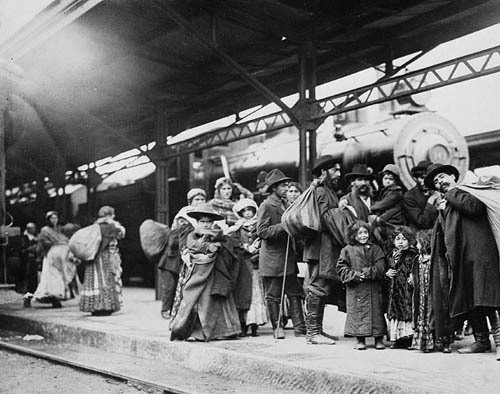 Immigrants waiting for their train to their final destination. “Finally, we were taken from here to our respective stations. We who were going on the [name deleted] Line crossed in a ferry to a dingy, dirty, unventilated waiting room next to the station in Jersey City. There we waited from 6 o’clock in the evening until after 9. About 8 o’clock the attendant signaled us to go downstairs, showing our tickets as we went. We all expected we were to board the train, so anxiously hurried along, dragging our heavy and numerous hand baggage. The poor, travel-tired women and the sleepy little children were pitiful sights. Arrived at the bottom of the long stairs, we waited and waited, but there was no train. “Finally, the same attendant summoned us to return upstairs. Weary, tired, and disappointed, we climbed up again. Finally we were led to our train in the big station. We were again sorted according to our destination and our train proceeded to Philadelphia. There we halted somewhere in the yards. Our entire coachful was to change cars. We piled out in the middle of the night, all laden down with baggage, the women having, in addition, sleeping and sleepy little children. “A trainman guided this weary and dejected party along the car tracks through the sleet and snow over an endless distance, it seemed, to the station. There pity seized him, or else he was tired from helping carry the baggage of one poor woman who had five small children with her, and he allowed her to remain in the waiting room. The rest of us, with our baggage, trudged farther on to what evidently was a lounging room for section hands. “We were locked in there for an hour and a half, when we were again led to the station to be put on a train. They assigned us to the smoker—women, children, and all—and refused even to open the women’s toilet for us, compelling us to use the men’s. Read about immigrants, their experiences, and the people they encountered at Ellis Island in the historical novel, Guardians of the Gate.